Let’s start with the good news: Infant mortality has reached an all-time low. 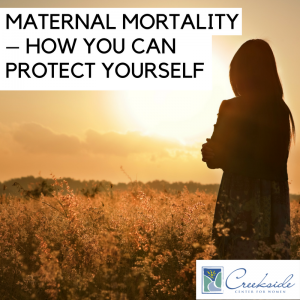 While this is cause for celebration, a recent analysis by the CDC found that mothers in the United States have a higher rate of dying after giving birth than many other developed countries. This rate has been creeping up for the past two decades. Hospitals throughout the country are working hard to improve systems, but you can take steps to lower your risks as well. Many cases of postpartum death have underlying medical conditions such as diabetes, obesity, heart disease, high blood pressure, depression, and substance abuse. If you go back to the hospital for any reason in the months after your delivery, it is important that you return to the hospital where you delivered so that the healthcare providers can access your records. If you go to a different hospital, bring your medical records and discharge instructions. The researchers found that one of the major issues linked to postpartum death was when doctors didn’t have access to all a patient’s medical records. Hemorrhage: Excessive bleeding, or hemorrhage, is the leading cause of maternal mortality. While you can’t prevent hemorrhage, you can be aware of the symptoms. It’s important to be aware that hemorrhage can happen up to two weeks postpartum. While it’s normal for bleeding to occur for several weeks postpartum, go to the hospital if you begin soaking a pad more than once an hour. Infection: Something as common as getting the flu can compromise a new mom’s health. Wash your hands often and get your flu shot. New moms are also at risk for sepsis, which occurs when your body is fighting off an infection. Sepsis causes fever, a high heart rate, and low blood pressure. Call your doctor if you’re experiencing any of those symptoms. Heart disease: Heart problems in pregnancy can be hard to diagnosis because many of the symptoms, such as swelling, are also common pregnancy symptoms. If you are having chest pain, trouble breathing, a severe headache, or are coughing up blood, you should call your doctor or go to the emergency room immediately. Mental Health Issues: Postpartum depression, partner abuse, and drug abuse are the typical problems that cause mental health issues in mothers. Symptoms of postpartum depression include persistent feelings of sadness, a desire to escape, feeling like your family would be better off without you or thoughts of hurting yourself or your baby. If you are having thoughts of hurting yourself and can’t get to a doctor’s office or emergency room, please reach out the suicide hotline (1-800-273-8255). If you are being abused or feel unsafe, call the domestic violence hotline (1-800-656-4673). If you are struggling with substance abuse, talk to your healthcare providers. They want to help you. A healthy pregnancy starts with a healthy mom. Meeting with your doctor before you get pregnant is extremely important for a healthy pregnancy and postpartum recovery. Call Creekside Center at (479) 582-9268 to set up your appointment with one of our caring providers today. Building U.S. Capacity to Review and Prevent Maternal Deaths. (2017). Report from maternal mortality review committees: a view into their critical role. Retrieved from https://www.cdcfoundation.org/sites/default/files/upload/pdf/MMRIAReport.pdf.